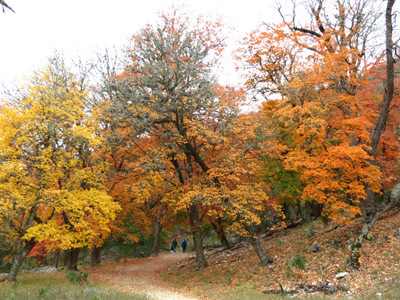 Lost Maples State Natural Area provides bright color for a fall hike. 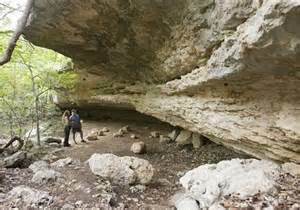 From the remote mountains and desert of far west Big Bend National Park to the Gulf Coast’s Padre Island National Seashore (which protects the longest undeveloped barrier island in the world), Texas offers a bounty of hiking opportunities and venues for exploring the glories of nature in the state. 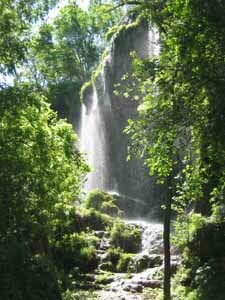 Hike to this waterfall at Colorado Bend State Park. Thirteen National Park Service sites and more than 90 state parks are filled with countless opportunities for recreation, exercise, solitude, or relaxation—whatever suits your outdoors style. You can get a free copy of the Texas State Park Guide with information including maps, amenities, activities, and programs at any state park or download a copy. 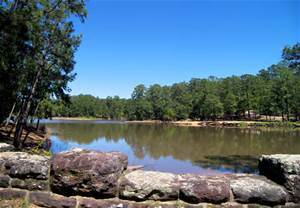 Bastrop State Park has plenty of family fun. Some favorite family trails and nature walks can be found at Pedernales Falls State Park near Austin, Monahans Sandhills State Park Near Odessa, and Huntsville State Park, which meanders through a pine forest. Inks Lake State Park and Franklin Mountains State Park are two of the best places to witness spectacular sunsets. If you like more challenging hikes, try the Lighthouse Trail at Palo Duro Canyon State Park in the Panhandle. Backpacking and overnight stays are common at Big Bend Ranch State Park and Lost Maples State Natural Area--two distinctly different regions of the state with vastly different scenery. Several books provide help to determine appropriate routes, whether you travel on foot or by bicycle. E. Dan Klepper’s 100 Classic Hikes in Texas describes trails and provides maps and photographs for his favorite hikes. Trail length varies from the quarter-mile Windmill Nature Trail at Seminole Canyon State Park near Comstock to the 7.5-mile Upper Canyon Trail in Caprock Canyons State Park, northeast of Lubbock. If you want to hike in the rough and tumble western section of Texas, put Laurence Parent’s book, Hiking Big Bend National Park, in your backpack. 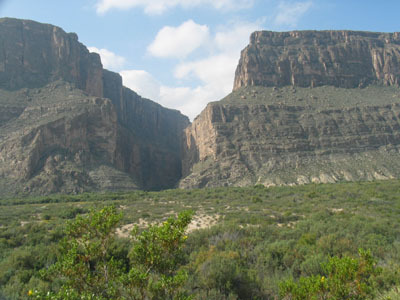 Parent explores 44 hiking trails in the remote national park and others in Big Bend Ranch State Park. The Texas Parks and Wildlife Department offers information online. Whether you are looking for a short nature trail or an adventurous, all-day endeavor through remote landscapes, Texas is prime hiking territory.